After writing about The Roar of Love and The King of Elfland’s Daughter in the last couple of blog posts (which adapt C S Lewis’s The Lion, the Witch and the Wardrobe, and Lord Dunsany’s The King of Elfland’s Daughter), I was going to finish off this trilogy of mewsings with a look at a piece based on The Lord of the Rings. There are certainly plenty to choose from — see the Tolkien Music List for a comprehensive, not to say mind-boggling, index — but I chose something different from my usual musical tastes, Johan de Meij’s “Lord of the Rings” symphony, a classical piece in five movements inspired by Tolkien’s trilogy. The trouble was, it didn’t quite do it for me. That may be down to the fact that I don’t listen to a lot of classical music (though I do have my favourites). I’ve been listening to it this week (particularly the fourth movement, “Journey in the Dark”, which I keep wanting to like, as it’s my favourite part of the trilogy), but although it works as music, and is pleasant enough to listen to (and has won awards — the Sudler International Wind Band Composition competition in 1989), it isn’t quite what I was looking for in a piece of fantasy-themed music. Which got me thinking about what I was looking for. In short, something that evokes the fantastic through music. Something that creates that peculiar sense of both otherness and long-lost familiarity, of weirdness and never-never once-upon-a-time-ness, of what the Romantics used to call “the Sublime”, that you get from great fantasy in any form, whether it be fiction, art, games, or anything else. So here’s a test. Rather like Ursula Le Guin’s “Poughkeepsie” test for fantasy fiction (where you replace all the fantastic names with mundane ones, and see if the result still has something of Elfland in it), the “Poughkeepsie” test for music would be to ignore the names given to the tracks and ask if they still evoke a feeling of fantasy. This might be a bit unfair on de Meij’s symphony, as it’s the first wholly instrumental piece of music I’ve looked at for its fantasy content. After all, songs can evoke a feeling of fantasy through their lyrics. But it’s also true that instrumental music can create that fantasy feel. In classical music, the prelude to Vaughan Williams’s Sinfonia Antarctica is perfect fantasy music — in fact, I think it would make an excellent soundtrack to the opening chapters of Dracula, with its bleak wind effects and the weird, wordless singing of three female voices evoking the Count’s trio of undead brides. Similarly, Ligeti’s “Lux Aeterna” (which is used at the end of Kubrick’s 2001), uses wordless, microtonal singing to get a really unearthly effect. (Strange how the human voice can be the weirdest of all instruments.) Also, of the albums I’ve looked at so far, both in the previous two posts and in my top five fantasy concept albums a while back, it’s tended to be the music, rather than the lyrics, that really makes them work in evoking that fantasy feel. Anyway, I’m going to keep looking. Onward, to the inward! Fantasy worlds created in childhood sometimes spill over into adulthood. Thus we have E R Eddison’s peculiarly childish naming scheme for the races in his otherwise sublime novel The Worm Orobouros (with Witches, Demons, and even Pixies being his warring nations of basically human warriors). Thus we also have Emily Brontë continuing to write poems about the invented lands of Angria and Gondal (which she and her siblings had worked on intensely as children) right through to the end of her life. And thus we also have the world of Rhye — or hints of it — a childhood fantasy world created by Freddie Bulsara and his sister, which crept into reality when Bulsara became Mercury, and Queen recorded their first two albums. I’m picking Queen II (from 1974) as the fifth of my top five fantasy concept albums, but really I’m picking the fantasy concept album that might have been, had Freddie Mercury taken over the whole thing and expanded the handful of fantasy-themed songs on the group’s first two releases into a complete concept album. My fantasy fantasy concept album, you could say. And what an album it would have been! Early Queen manage a misty-morning never-never sound that tints many of their non-fantasy songs with the fantastic (“Nevermore”, “White Queen”); they also manage an almost religious grandiosity with equal conviction (the epic “Prophet’s Song”, “Jesus”) — both essential elements in a full-fleshed fantasy. When actual make-believe enters into it, we get something as baroque and filigree as the Art Nouveau-esque “My Fairy King”, as operatic as “The March of the Black Queen”, or something in the straight-ahead rock leagues like “Ogre Battle”. There’s humour, (“she boils and she bakes and she never dots her i’s” from “Black Queen”) — something which can puncture the make-believe bubble unless handled properly (in this case, with sufficient bombast) — there’s lyricism, and there’s even something that sounds like it was inspired by Dungeons & Dragons (“Can’t go east cos you gotta go south” from “Ogre Battle”), though of course D&D wasn’t released till 1974 (and I doubt it reached England immediately), while Queen II was recorded in 1973. 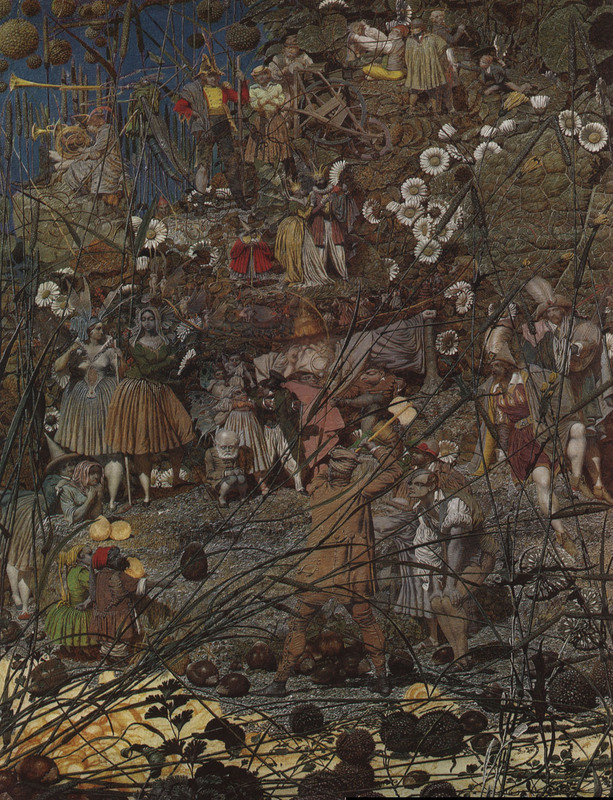 Centrepiece of the whole thing must be “The Fairy Feller’s Masterstroke”, a rendering in music of Richard Dadd’s intensely-detailed painting (and quoting from the peculiar poem Dadd wrote to accompany the picture, apparently in an attempt to prove it was a rationally reasoned-out subject, and not entirely produced by madness). At a mere 2 minutes 41 seconds, the song contains almost as many textures and details as the painting, and is one of the few examples of one work of art inspiring another of equal value. Speaking of works of art inspiring others, there have been (I think) two fantasy novels written using Queen’s fantasy songs for inspiration. I read one, in the late eighties (I think), and can’t remember what it was called or who wrote it. And I don’t really want to. The secret of a successful adaptation from music to literature is, I suspect, not to be too literal. When I realised the plot of the novel was building up to a battle between two ogres, my heart sank. I remember glancing at another fantasy novel more recently which was inspired by Queen’s fantasy songs, but can’t remember the details, and the internet (in a brief search, I have to admit), seems equally disinclined. (I did uncover a video game, Ogre Battle: The March of the Black Queen, from 1995, though).